Nearly a year ago, at Christmas, the Doctor regenerated. For the first time in the show’s history, the time-traveling alien regenerated into a woman. 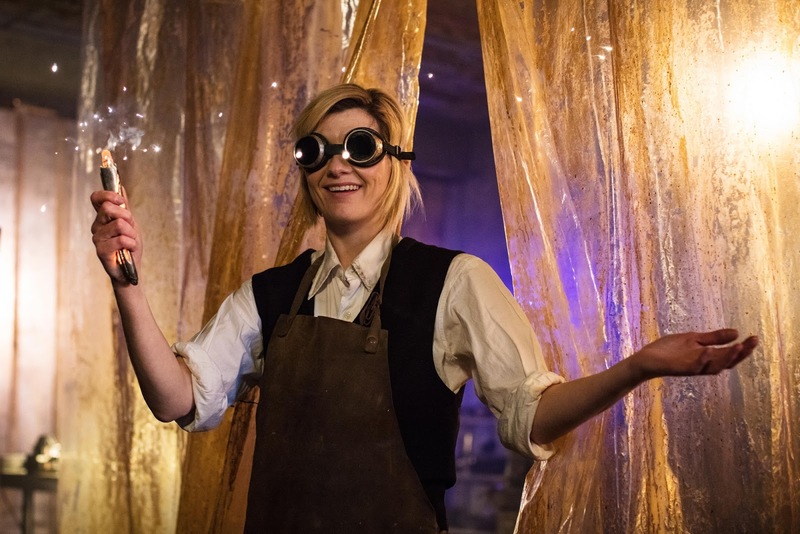 Jodie Whittaker became the Thirteenth Doctor... and was promptly dropped out of the TARDIS and into the night sky. You’d think the TARDIS would be a little more understanding about regenerations by now, but apparently not. Since then, we have all eagerly awaited seeing Thirteen in Doctor-y action and the time has finally come to say a proper hello. Soon-to-be new friend (previously known as “companion”) Ryan is in his early twenties and still trying to learn to ride a bike. We’ll learn later that Ryan has dyspraxia, a developmental disorder that affects coordination but can also impact memory, planning, and organization. His gran, Grace, pushes him towards her second husband — another soon-to-be new friend — Graham. When Ryan falls again, he chucks his bike off the mountain cliff and then has to hike down to find it. That’s where he encounters a glowing geometric something in the air and touches it. A giant Hershey’s Kiss-shaped pod appears in its place. Ryan touches that too, because why not? Our third new friend is Yasmin, a meter maid looking to do more than break up parking disputes. Her supervisor sends her to investigate Ryan’s call about the pod. She and Ryan went to primary school together and their history makes her wary of believing his story until she also touches the pod and finds it’s freezing. As Graham and Grace are on the train, the power suddenly goes out and the train slams to a halt. Only the couple and a young man named Karl are trapped as a dark, tentacled mass of electricity starts hovering towards them. Just then a figure falls through the roof between the passengers and the alien. It’s the Doctor! Quickly getting her bearings, she electrocutes the tentacles to buy them time but doesn’t have her sonic screwdriver to unlock the doors. She didn’t get the memo that every new Doctor has to have a new sonic, of course. Just as Ryan and Yaz arrive, alerted by a call from Grace, the creature zaps them all and flees through the Doctor-sized hole in the roof. Understandably, everyone is freaking out. The Doctor is struggling to remember her own name and is operating without a TARDIS as well. It exploded and dematerialized. However, she does manage to convince Yaz not to file a report just yet. Graham espouses that they don’t “get aliens in Sheffield,” so what they saw must’ve been something else. That’s all well and good, Graham, but what about when you see a giant alien pod sitting in woods? The group (minus Karl, who leaves as soon as he can) goes back to where Ryan and Yaz left the pod... but it’s gone. They weren’t the only ones looking for it. Rahul has been searching for this pod for years. He brings it back to his warehouse and sets up video cameras to record as he watches it crack open. A creature that looks reminiscent of an Ice Warrior emerges. Rahul demands to know where his sister is, but he gets no answer. The creature kills him on contact. On top of a building somewhere in the city, the tentacle creature is scanning the city looking for someone. The Doctor has reached the end of her post-regeneration high. She faints with her finger FIRMLY up her nose (trying to gauge when, precisely, she would faint) and rests on Ryan’s couch. She bolts upright when she realizes they’ve all been implanted with DNA bombs, which — you guessed it! — will kill them when they go off. Snatching Ryan’s phone and erasing all his data, the Doctor uses it to zap herself and rushes off. The reformatted phone is supposed to lead them to the tentacle creature but instead, they find the creature from the pod. It runs off before the Doctor can question it. The team does locate Rahul’s body, though. Frustrated without her sonic, she decides to build one out of whatever is left in Rahul’s warehouse. The result is a rough looking sonic that’ll certainly do the job. While she’s working, Ryan and Yaz find a video on Rahul’s computer explaining that his sister was taken years ago, and he’s been tracking whatever took her in hopes of finding her again. For the new sonic’s debut act, the Doctor scans the pod and finds tech that will allow the creature to return home. The Doctor theorizes the two aliens are using Earth as a battleground. They head off once again in search of the tentacle alien. Looking like Ghostbusters, they surprise it on the roof and overload it with electricity. But the Doctor’s theory was wrong. The alien was simply a gathering coil, designed to scan and gather data for something else — a.k.a., the other alien... who is now on the roof too. The warrior alien explains he is a Stenza, a warrior race that collects teeth from their victims and wears those teeth on their face. Gross gross gross. Tim Shaw (yeah, that’s his name) is on Earth hunting a randomly selected human as part of the Stenza’s ritual for choosing a new leader. But, as the Doctor delights in pointing out, he’s cheating big time. He’s supposed to use no weapons, but the gathering coil was locating the human for him and implanting DNA bombs. She rubs it in his tooth-filled face that he’s too weak to be a leader. I love her sass, but it’s maybe not the right time because Tim has a short-range teleporter and is determined to find his target. Who is that? Karl, of course — the poor other passenger on the train. He’s working at a construction site when he spies Tim climbing a crane toward him. The Doctor, Graham, Grace, Ryan, and Yaz arrive to help. While the older couple gets all the other workers clear, the remaining three climb another crane in the hopes of reaching Karl first. Karl nervously crawls towards them as Yaz and Ryan swing the Doctor on a crane to reach him. The revived gathering coil blows the circuit, though, stopping the crane short. After much coaxing, the Doctor gets Karl to jump towards her, but Tim plucks him right out of the air. Still in Twelve’s Doc Martens, the Doctor takes a running jump after them and just makes it. She bargains for Karl’s life and the lives of the others by threatening to destroy Tim’s recall button. He won’t be able to leave Earth without it. In perfect Doctor fashion, she offers Tim a chance to change his mind, but when he elects to blow up the DNA bombs, he finds out the Doctor remembered who she is after all. She’s the Doctor, and no matter what face she has, she always knows how to reverse the polarity, so to speak. Instead of blowing up the bombs, Tim destroys his own DNA. Karl gives him a well-deserved shove off the crane, Tim snatches the recall button, and teleports home. Sadly, Grace and Graham don’t know the day is saved. All they see is the gathering coil still causing problems. Grace climbs up to destroy it, and succeeds, but is electrocuted in the process and falls to her death. Pretty crappy to introduce this wonderful character, who we knew wasn’t a “companion,” and then kill her off in the same episode. Ryan’s absentee father doesn’t show up to the funeral for Grace. And she was his mother. That’s cold. Graham delivers a sweet eulogy. In a conversation with the Doctor, he reveals they met when he had cancer. Grace was his chemo nurse. He can’t help feeling he was the one who was supposed to die, not her. Ryan and Yaz take the Doctor shopping to finally get her out of the war-torn clothing from her predecessor. She emerges in the new costume we’ve all already seen, suspenders and all. Feeling more herself — or rather figuring out her new self — the Doctor devises a way to use Tim’s pod’s technology to locate the TARDIS. The trio helps her activate the tracker... but then are all sucked into space alongside her. She turns to see them suffocating among the stars. This was a good first outing for Chibnall and Whittaker, as well as the supporting cast. I worry how the story will balance three very different companions (can I still call them that or do I need to say "friends" now?) but I like them all so far. When Ryan admitted to touching two unknown objects and everyone shouted at him in disbelief and the Doctor immediately said she’d have done the same thing... I knew Ryan was going to be a great companion. I can already tell Whittaker’s face journeys are going to be a highlight of her run as the Doctor. She pulled several fantastically funny faces in this premiere alone.